In my previous article, I addressed a few of the obstacles that stand in the way of good film adaptations of novels. In fact, I think many of us become so jaded by disappointing film adaptations that we believe the old proverb, “the book is always better than the movie” to be a universal truth. Well, I have rounded up a few films which, in my humble opinion, prove this statement false. In fact, there are so many great films adapted from novels that it made choosing only ten (which seemed like a good, round number) rather stressful, so I had to turn it up to eleven. To make my decision a bit easier, I whittled down the list by including films new and old, from comedy to thriller. As this is by no means a definitive list, I would love to hear your favourite adaptations in the comments below! Just thinking (and writing) about Gregory Peck’s portrayal of Atticus Finch sends shivers down my spine. Finch stands out in my mind as one of the greatest heroes to ever grace paper or screen. The purveyors of illustrious awards seemed to agree: To Kill a Mockingbird won three Academy Awards, with Peck taking home Best Actor and screenwriter Horton Foote accepting Best Writing- Adapted Screenplay. The American Film Institute chose Atticus Finch as the greatest movie hero of the twentieth century. Need I go on? So what makes the Robert Mulligan directed film such a successful adaptation? It certainly had a lot to live up to, as Harper Lee’s 1960 novel is well loved in its own right. In fact, I would posture it as one of the select novels that has become deeply engrained in America’s collective conscious. I grew up in Southern America, and I can attest to its cultural significance in the region. The film is able to measure up thanks, in large part, to its parade of powerful performances. I realise that I have prattled on quite enough about Peck’s role, but, truly, all of the actors’ performances are not to be missed. Among them are Robert Duvall’s break-out role as the misunderstood, gentle giant Boo Radley, and Mary Badham’s portrayal of Scout, which is at once beautifully innocent and pure, but also wise beyond her years. It’s a goldmine. First of all, let’s talk about the fact that this seminal classic is based on a book. Did you know that? I sure didn’t. Well, not until an embarrassingly short time ago, that is. And I call myself a literature major—the shame. The novel, also entitled The Graduate, was written by Charles Webb and published in 1963. It has obviously been far eclipsed by the success of the film, and for good reason. The screenplay, adapted by Buck Henry, is nearly identical to to Webb’s original novel. Webb’s story relied on very little narration, which made it a perfect candidate for screen adaptation. The book is choppy, blunt, and altogether artless. Dustin Hoffman’s unforgettable portrayal of Ben Braddock, a directionless and disillusioned graduate facing a nation on the brink of social change, also represents a great improvement from the original material. While Braddock’s numbness and apathy to the world around him remains apparent in the film, Hoffman managed to make the character more likable and sympathetic. Or maybe I’m just feeling a bit of sympathy for the devil as I am a soon-to-be graduate, overwhelmed by the prospect of the “real world”? …. Nah. Director Mike Nichols and Director of Photography Robert Surtees were creative when it came to visually telling to the story. The Graduate is a fine example of what the film medium can bring to a story that the written word cannot. It is so stylishly and compellingly shot. The indifference and detachment that plagues Ben’s inner-life is often perfectly projected onto the outside environment. The deft camerawork cleverly intimates the shock Ben experiences at the unsolicited advances of Mrs. Robinson. And then all of this brilliant direction is set to the sweet, sweet sounds of the folk-pop-singer/songwriter gods, Simon & Garfunkel. The combination is irresistible, and nothing illustrates the movie magic as well as the final scene. No words are needed, their expressions say it all, and it is heartbreaking. One Flew Over the Cuckoo’s Nest is the second film to ever win all five of the “major” Academy Awards. I find this statement altogether ridiculous, as I consider any Academy Award to be “major.” Nevertheless, it is a fine and rare achievement for a film to win the Oscar for Best Director, Best Actor, Best Actress, and Best Writing – Adapted Screenplay. A faithful adaptation of the 1962 novel by Ken Kasey, the film follows institutionalization of Randle McMurphy, a criminal who fakes mental illness so he can serve his sentence in a psychiatric hospital. Though Kasey was originally involved with the film, he pulled out early on in production due to creative differences. Namely, Kasey disagreed with the casting (reportedly, he wanted Gene Hackman to play the role that won Jack Nicholson an Oscar) and the film’s changes to the narrative point-of-view. Curiously enough, one more of Nicholson’s memorable roles is in another film adaptation that also does not have the author’s stamp of approval. Despite The Shining‘s current status as a horror classic, Stephen King was vocal about his dislike of director’s Stanley Kubrick’s vision. There does seem to be a trend of authors who were less than impressed with their novel’s film adaptations, which is not altogether surprising. Joseph Conrad’s novella, Heart of Darkness, is explored through a modern context in Francis Ford Coppola’s Apocalypse Now. Hailed as one of the great anti-war films, Coppola’s adaptation displaces Conrad’s characters in the middle of the Vietnam War. Revealing the consistency of human nature, Conrad’s tale of nineteenth century imperialism transfers compellingly out of the heart of the African Congo and into the jungles of Vietnam and Cambodia. The film is a masterpiece, and you will find it on just about everyone’s “greatest films list.” The adaptation took advantage of the novel’s original frame narrative, which works really well with Martin Sheen’s Captain Benjamin L. Willard serving as the narrator. The writing is fantastic (“I love the smell of napalm in the morning”), the cinematography stunning, and the performances are utterly captivating. I am unfailingly chilled to the bone as Colonel Kurtz (Marlon Brando) looks through the camera, straight into my soul, and croaks with the most pregnant of pauses, “You’re an errand boy, sent by grocery clerks, to collect a bill.” Oh, the horror, the horror. The making of Apocalypse Now has achieved an almost mythic status in the film world. The documentary film about the production of Apocalypse Now, Hearts of Darkness: A Filmmaker’s Apocalypse Now premiered in 1991 to great critical acclaim. Directed by Fax Bahr, George Hickenlooper, and Eleanor Coppola (wife of Francis Ford Coppola), the documentary chronicles the many difficulties the cast and crew encountered while filming the ambitious project. When a film promises you “fencing, fighting, torture, revenge, giants, monsters, chases, escapes, true love, [and] miracles,” what else could you ask for? Nothing. The Princess Bride ticks all of the boxes, and with a good laugh to boot. Though a modest success at the box office, this film has become a cult favourite. In fact, the film is so popular that I almost hesitate to label it “cult” at all. It is a faithful adaptation of William Goldman’s novel of the same name. Goldman also wrote the screenplay, which explains why the story remained so well intact from manuscript to screenplay. There are small differences between the novel and film, but all of Goldman’s changes are helped to streamline the story for the transition to the screen. Similar to the framework of the novel, the film’s framework cleverly gives a precedence for its voice-over narration. The film approaches the story as, well, an actual story in that it is set-up as a grandfather reading a fictional novel to his sick grandson. The grandfather’s narration also lends that unmistakable fairytale quality to the film. A successful adaptation of many reasons, but I am also inclined to believe that the film is such great fun because the cast and crew had an even better time making it. Actor Mandy Patankin (perhaps better known as the infamous Spaniard, Inigo Montoya) claims to have bruised a few ribs in filming, but this surprisingly did not occur during any of his fencing, fighting, torture, or revenge scenes. Quite the opposite, in fact, as Patankin has revealed that he incurred the injury by trying not to laugh during the Miracle Max scenes. Apparently, Billy Crystal (Miracle Max) had everyone in fits of laughter for three days while he improvised medieval jokes. It’s like I haven’t even seen the movie— breaking both the first and second rule of Fight Club, which are memorably, “you do not talk about Fight Club,” and “you DO NOT talk about Fight Club.” Whoops. Chuck Palahnuik’s 1996 novel made a much-talked about (it’s as if no one watched the film, actually) turn to the screen in the David Fincher directed film. 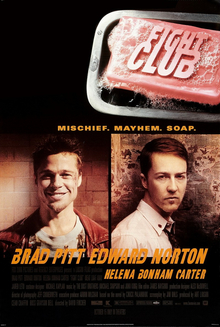 The story follows an unnamed narrator (Edward Norton) who is uninspired by his office job and uneventful life, until goes topsy, turvy, and trippy when our narrator meets Tyler Durden (Brad Pitt), a mysterious and reckless soap maker. The two found a fight club to combat the crushing numbness of existence, and the rest becomes a minefield to explain. I spoil everything– as far as movie and television, I mean. It’s always unintentional, and I’m afraid that I often just let something slip. Fight Club is one of those films that you DO NOT want spoiled, so I’m going to be fairly cryptic and brief. I will say that the film makes frequent, yet fantastic use of voice-over narration, something that many films struggle to balance with the visual narrative. In fact, I can only imagine how tricky the novel was to adapt for the screen for this reason. I’m too nervous to say anything else… If you haven’t yet, watch the film and be prepared to have your mind blown. Directed by Mary Harron (Harron also co-wrote the screenplay), American Psycho has become a cult favourite and a Christian Bale classic. The film opened to mixed reviews at 2000’s Sundance Film Festival, but garnered more praise upon its theatrical release. Part horror and part satire, American Psycho invites the audience for a look into the psychotic mind of Patrick Bateman, a high-powered businessman deep into murders and executions. Bateman, at least, is an aware serial killer as he matter-of-factly notes, “there is an idea of Patrick Bateman; some kind of abstraction. But there is no real me: only an entity, something illusory. And though I can hide my cold gaze, and you can shake my hand and feel flesh gripping yours and maybe you can even sense our lifestyles are probably comparable… I simply am not there.” He is a dark personification of the culture that surrounded Wall Street in the 1980’s. Greed, narcissism, misogyny, and consumerism fills both his and his peers otherwise vacuous existence, only Bateman also has homicidal tendencies. Though both novel and film have been known to polarize critics and audiences alike, no one can deny that they incited a fair amount of thought-provoking discussions. I know there are more accomplished film adaptations than Bridget Jones’s Diary, but I did say that I wanted to represent a variety of genres on this list. After all, film adaptations are not just for the E.M. Forster or Leo Tolstoy novels. Bridget Jones’s Diary proves that “chick lit” can translate well to the screen. Not all of them are doomed to be like your run of the mill Nicholas Sparks film. Based on Helen Fielding’s 1996 novel of the same name, Bridget Jones’s Diary is a hilarious romantic comedy of errors. The Sharon Maguire-directed film divulges the disastrous diary of Bridget Jones, a thirty-something single woman with a riotous love life. Bridget Jones was actually borne out of a column Fielding wrote for The Independent. While Fielding’s beloved story feels neither stale nor outdated, it does owe Jane Austen’s timeless novel, Pride and Prejudice a fair amount of thanks. The adaptation is made by the spot on casting. Renée Zellweger even earned a Best Actress Academy Award nomination for her portrayal of the loveably bungling Jones. An adaptation that accurately (though the rest of the film can hardly be called accurate) captures the difficulties of, well, adaptation. Charlie Kaufman plays fast and loose with his source material in 2002’s Adaptation. With screenplays like Being John Malkovich and Eternal Sunshine of the Spotless Mind on his CV, Kaufman’s propensity for original stories and his inventive approach to the telling of those stories speaks for itself. So when hired to write the screenplay for Susan Orlean’s The Orchid Thief, it is really not too much of a surprise that Kaufman went in an unexpected direction. Orlean’s 1998 non-fiction book began as a piece of investigative journalism for The New Yorker on the arrest of John Laroche, who was caught poaching a rare orchid in the Florida Everglades. Kaufman struggled with adapting the story, and ended up writing a screenplay about said struggle with some major fabrications. It is all very self-referential, and it makes the film nearly impossible to talk about without ending up in a tangle of meta-confusion. Kaufman’s extensive use of voice-over is clever, fresh, and endears us to the character of self-deprecating Charlie Kaufman. In the film Charlie even attends a course taught by a screenwriting guru, who vehemently warns writers, “And God help you if you use voice-over in your work, my friends. God help you. That’s flaccid, sloppy writing. Any idiot can write a voice-over narration to explain the thoughts of a character.” It’s great stuff. Call me a nerd all you want, but Peter Jackson’s The Lord of the Rings installments are damn fine films and fantastic adaptations. I also have a bit of evidence to support that claim: the final installment, The Return of the King (2003) won ELEVEN Academy Awards (they won every category they were nominated for), including Best Writing- Adapted Screenplay. In fact, I distinctly remember watching the Oscars that year because of the comical amount of times New Zealand was thanked in The Lord of the Rings acceptance speeches. It was so ridiculous that host Billy Crystal quipped, “it’s now official. There is no one left to thank in New Zealand.” I would have to agree with Crystal—there were only sheep left to thank. J.R.R. Tolkien is the master of “high fantasy,” and a stunning writer and poet. While The Lord of the Rings is the epic journey upon which all other epic journeys are measured, the novels are not a non-stop adventure by any stretch of the imagination. Tolkien can, and does, expound on the act of walking, trudging, or any other form of journeying for what are, frankly, an inspirational amount of pages. Tolkien also weaves threads of the incredibly detailed mythos of Middle Earth throughout the novels, which is why I have been trying to read The Fellowship of the Ring for four years. I am an obsessive, meticulous reader (re: excuses for reading at the pace of a three-legged tortoise), and I am unable to move on until I understand everything. This means that I look like a crazed student studying for an exam whenever I casually pick up The Lord of the Rings. I am dog-earing pages, scribbling down notes, consulting the maps, referencing “The Fall of Gil-galad,” and tracing the political history of Gondor and Arnor. My point is that Tolkien’s world is so complete and he describes it all with great deference, which makes it an ambitious project to adapt. With a discerning eye, this cast and crew rose to the challenge beautifully. Not to mention that the special effects still look fantastic over a decade after the first film came out. A beautiful film with perfect performances set to a striking score. The film is a faithful adaptation of Ian McEwan’s gripping novel about love, betrayal, regret, and war. Adapted by screenwriter Christopher Hampton, Joe Wright’s film captures the romance and tragedy of McEwan’s original story so poignantly. Seamus McGarvey’s cinematography is stunning. Then there is the score. Horribly clever and captivating, the typewriter clicks and beats propel the audience through the film, keeping us permanently perched on the edge of our seats. Atonement took home the Academy Award for Best Original Score, which was composed by Dario Marianelli. An award well deserved. Word of friendly advice: if you, like myself, are often at the mercy of tender tear ducts during a sad film or book, DO NOT watch the film before you read the novel. I did, and it was a huge mistake. This was not because the film planted annoying preconceptions in my head thereby restricting my imagination whilst reading. No, I offer this advice because I spent the whole novel in a puddle of tears, as I already knew the ending that would befall the characters. And that’s all I have to say about that. Great article, and great selection. Love how you have an 11-item list! 🙂 This makes me want to watch/read all of these (even those I already have)!! !